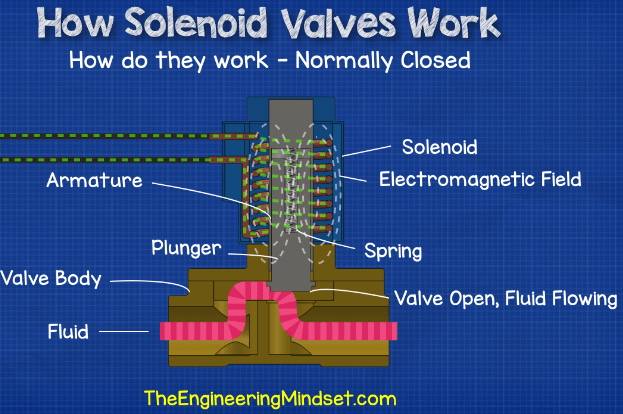 How Solenoid Valves Work, in this article we’ll be looking at how Solenoid Valves work. 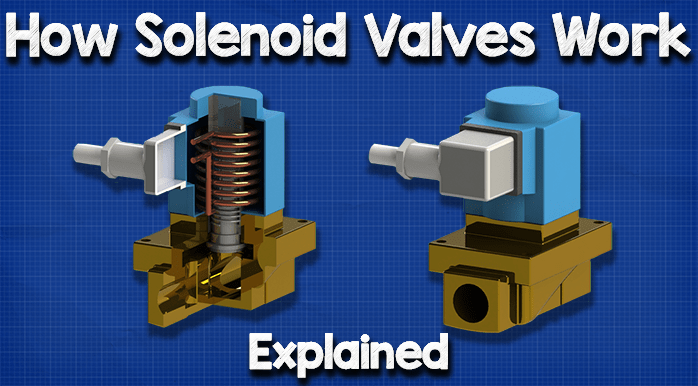 We’ll be looking at the basic operation of two types of solenoid valves. 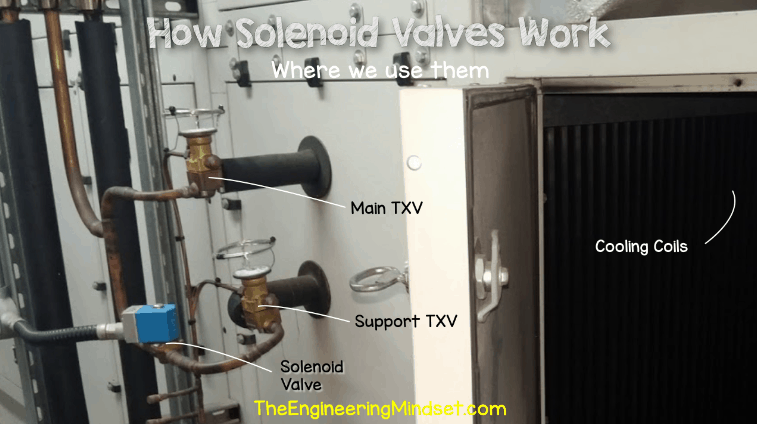 We’ll also cover what real solenoids valves look like, why solenoid valves are used, where solenoid valves are used and how solenoid valves work. If you’re working with solenoid valves, you’re going to want to download the Magnetic Tool app from Danfoss. The Magnetic Tool app, part of the Danfoss CoolApps Toolbox, makes testing a solenoid valve coil quick and easy and is available globally for Android and iPhone. 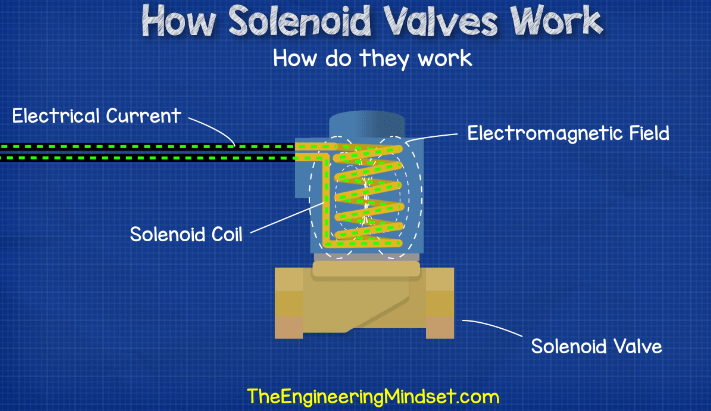 Solenoid valves are used to convert electrical energy into mechanical energy. Solenoid valves have a quite distinctive look about them. As you would expect, they have the valve body, but on top they have a block with some wires coming out. This top part is the solenoid and the bottom part is the valve, therefore making a solenoid valve. These valves do come in a variety of shapes and sizes I’ll just show you some examples below. The shape variation depends on the capacity of the valve, the pressure it’s working with and the different internal mechanisms. 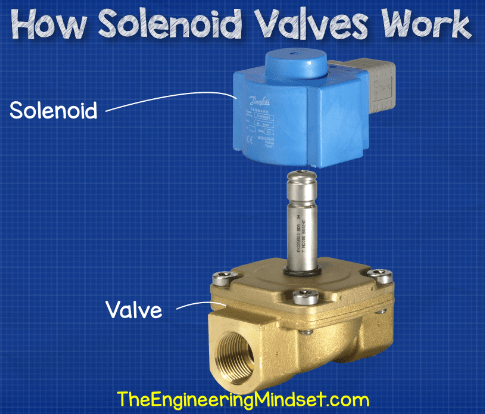 Why do we use solenoid valves? These valves allow engineers to autonomously and remotely control the flow of fluid within a system. This fluid can be a liquid or a gas. For example water, air, natural gas, oil, steam, refrigerant etc. the list goes on and on. The solenoid coil is used to operate the valve, by passing an electrical current through it to create an electromagnetic field and operate the valve. This means if it is connected to a controller, it can be operated autonomously and remotely by a computer without the need for engineers to run around physically opening and closing valves. 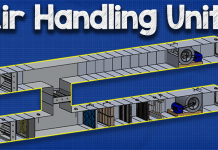 This allows systems to run much more efficiently and safely. 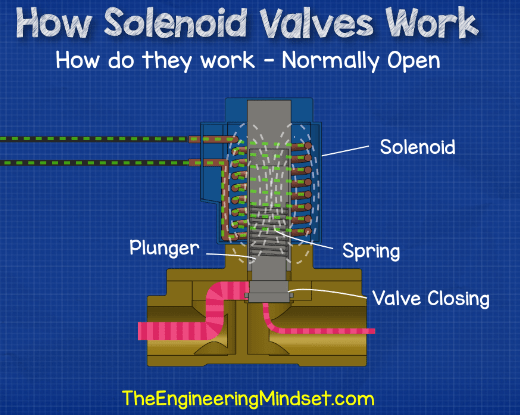 Where do we use or find solenoid valves? The short answer is EVERYWHERE! 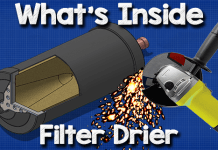 Solenoid valves can be found in everything from washing machines to space rockets, although we’re going to focus on industrial and HVAC applications in this video. In commercial refrigeration systems we’re almost certainly going to find at least one solenoid valve in the system and it’s usually found in the liquid line, near the expansion valve. 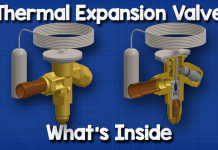 We’ve also covered how expansion valves work previously, check that out by clicking here. This has a double, direct expansion cooling coil inside to control the temperature of the air being sent around the building. 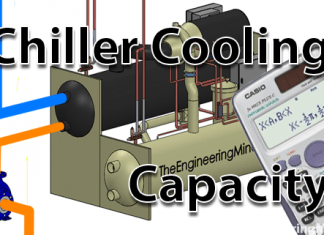 The top expansion valve and cooling coil is always on, when the system operates, but the second expansion valve and coil only come on in the summer when the cooling load is too large for the single coil to handle. The solenoid valve is therefore used here to isolate the second coil and expansion valve until it is needed. The controller then sends a signal to the valve to open and provide the additional cooling. Another very common application for solenoid valves, in refrigeration systems, is in the hot gas defrost line to control the flow of hot refrigerant into the evaporator during the defrost cycle. 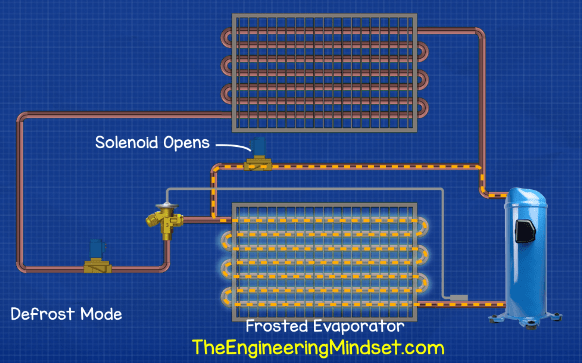 When the moisture in the air condenses on the tubes of the evaporator it will freeze and cause a build up of ice. We need to remove this to ensure efficient operation so we open the solenoid valve to send hot refrigerant from the compressor and through the evaporator instead of the condenser. Then, once the defrost has completed, the solenoid valve shuts and the system continues as normal in cooling mode. 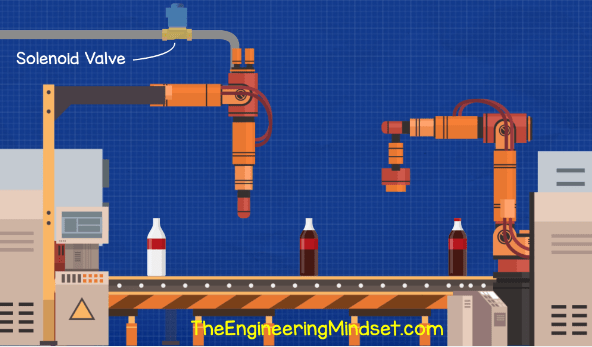 In industrial applications we can use these vales to precisely control the flow and mixing of fluids, for example to pour a perfect amount of fizzy drink into a bottle on a production line. We might also find solenoid valves being used in the production line to prevent leaks. 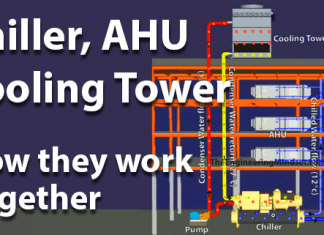 If a sensor detects a leak from the pipework then the solenoid valve to that part of the process line is shut off automatically to prevent product waste and protect the manufacturing equipment until engineers can fix it. 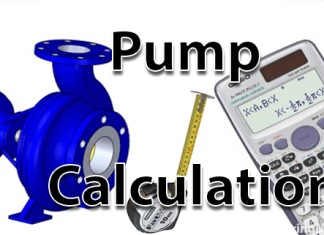 There are a few variations in how the valve operates depending on the required capacity and the pressures its working with. We’re going to focus on the directly operated valve which is the simplest version. With the directly operated valve we have the solenoid on top which is basically a coil of wire. 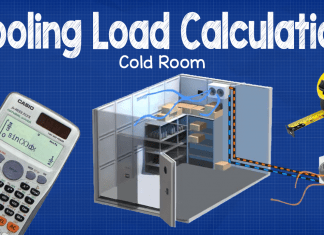 As you may have seen in our electrical tutorial videos. When we pass an electrical current through a coil, we generate an electromagnetic field. This magnetic field is what controls the valve. We have two types of valves, the normally open and the normally closed types. Lets look at the normally closed type first. Inside the valve we have the armature. The solenoid is placed over this and completely surrounds the armature so that it’s at the centre of its magnetic field. Inside the cylinder of the armature is the plunger and spring. At the centre of the coil the magnetic filed lines are the most compact and therefore the strongest. This why we place the plunger in the centre. Once the electrical current is stopped then the magnetic field disappears and the spring will force the plunger down again to close the valve. With normally open valves we again have the coil sit around the armature but this time the spring pushes the plunger in the upwards position so that the valve is always open unless the solenoid coil is powered. If we then pass a current through the coil it again creates an electromagnetic field but this time the field pushes the plunger instead of pulling it. When the plunger is pushes it will close the valve and stop the flow of fluid in the system. When the electrical current is stopped the spring will then force the plunger back into the upward position and open the valve again.